Am Sonntag, den 16. 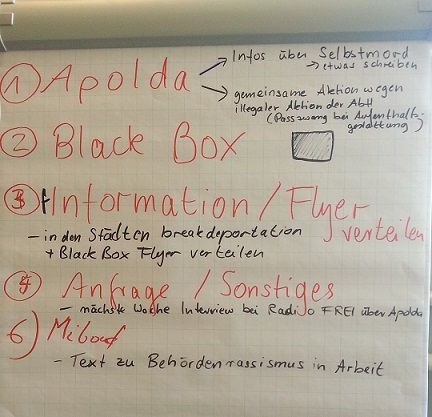 Dezember, findet unser General Meeting in Erfurt statt! 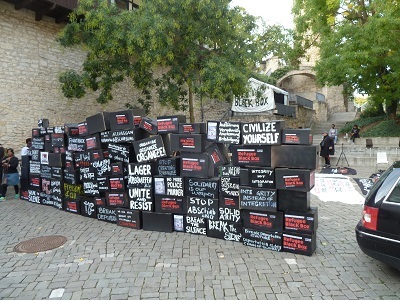 On Sunday, the 16th of December, we meet for the General Meeting in Erfurt. 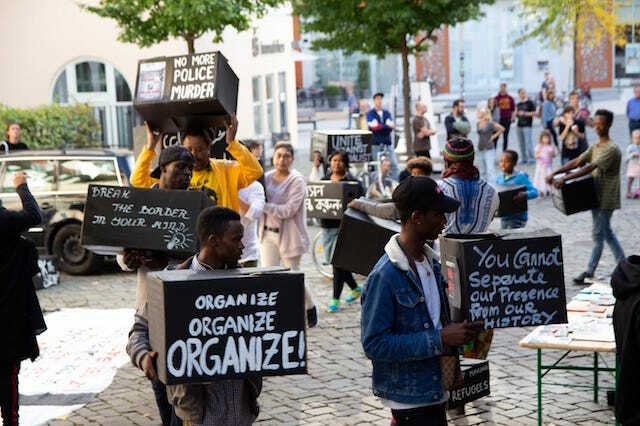 Join in, discuss and organize with us - together against Deportation and Isolation! - The African/Black Identity Series (ABIS). This event is only for the ABCs. 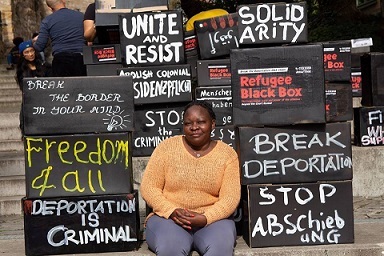 Power Up Party: Refugee Black Box Solidarity Against Deportation. Music is the force of the mind! Time: Start at 20.00 hrs. 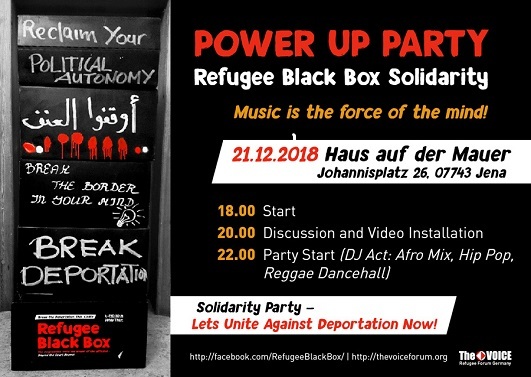 Solidarity Party – Lets Unite Against Deportation Now - Refugee Black Box Solidarity Against Deportation. 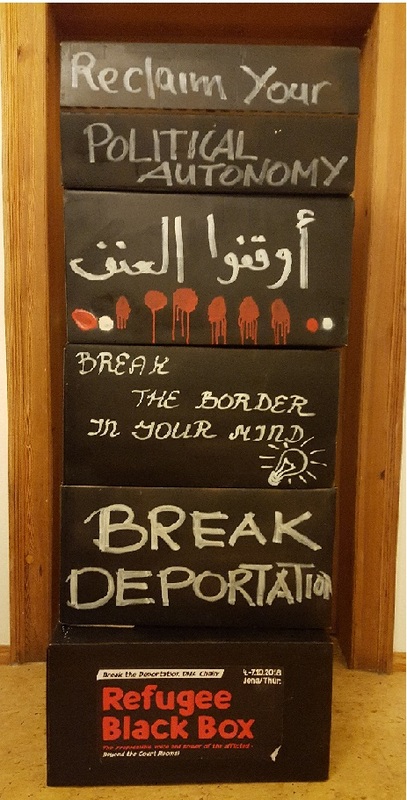 Unterstützt diesen Aufruf von Ahmad bin Ahmad Hadi an The VOICE Refugee Forum! 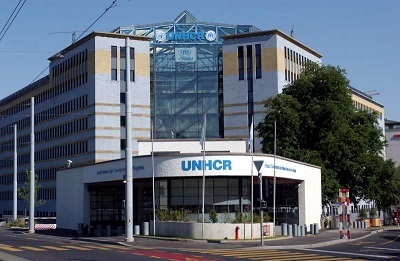 Bitte schreibt an den UNHCR in Kenia (mit Kopie an den UNHCR Genf) und setzt euch ein für das Resettlement von Ahmad bin Ahmad Hadi und seinem Sohn Khaled Ahmad bin Ahmad in eine Umgebung, wo er frei von Bedrohungen durch Saudi-Arabien ist! 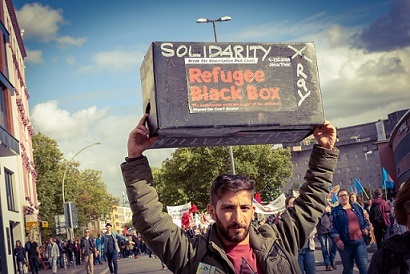 Im Rahmen der Vorbereitungen unserer BlackBox-Veranstaltungen 2018 in Jena erreichte uns im September der Hilferuf eines jemenitischen Flüchtlings in Kenia. 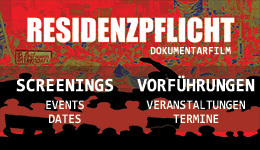 Wir unterstützen und dokumentieren hiermit seinen Aufruf (siehe unten). 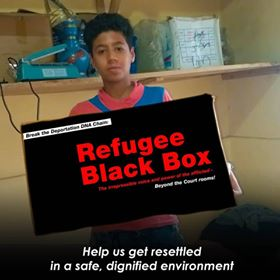 Support this appeal of Ahmad bin Ahmad Hadi to The VOICE Refugee Forum! 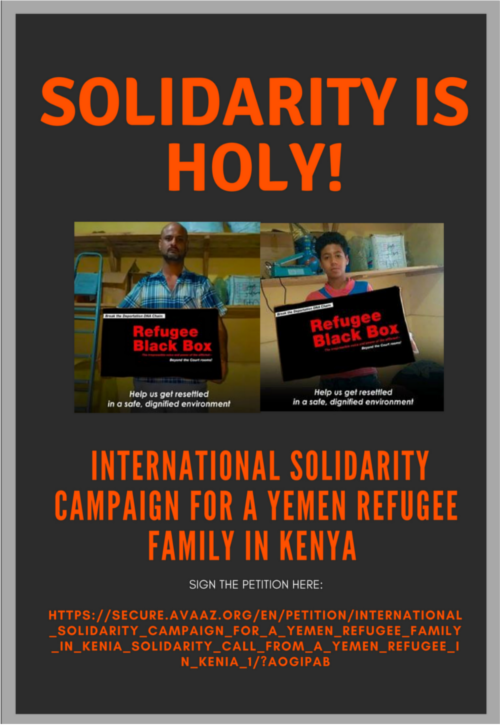 Please write to the UNHCR in Kenya and Copy UNHCR Geneva and appeal for the resettlement of Ahmad bin Ahmad Hadi and his son Khaled Ahmad bin Ahmad in an environment where he can be safe from the threats of Saudi-Arabia! 51. 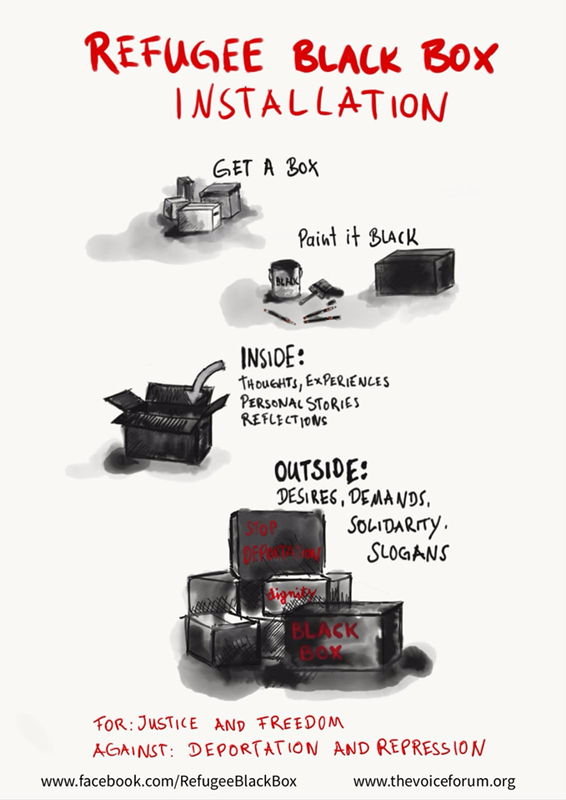 Edition: Listen to/ Hört THE VOICES: Highlights and Evaluation of the Refuge Black Box installations in Jena from 4th – 7th October 2018, with Mbolo Yufanyi /May Zeidani Yufanyi, and Co. 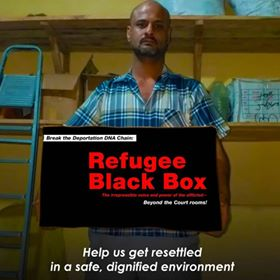 The Refugee Black Box Series presents – Highlights and Evaluation of the Refuge Black Box installations in Jena from 4th – 7th October 2018. Read more about 51. 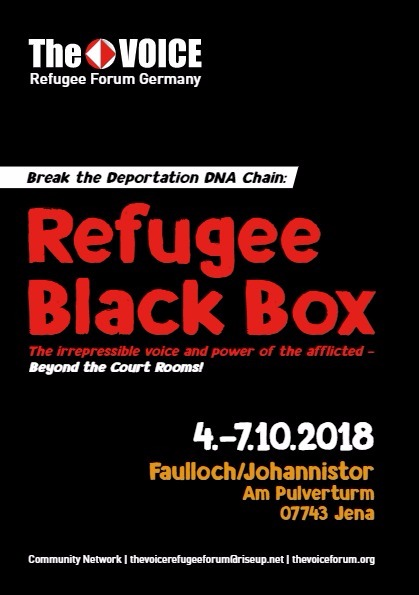 Edition: Listen to/ Hört THE VOICES: Highlights and Evaluation of the Refuge Black Box installations in Jena from 4th – 7th October 2018, with Mbolo Yufanyi /May Zeidani Yufanyi, and Co. It is time to strengthen our international solidarity! The only way to Victory is through Unity. 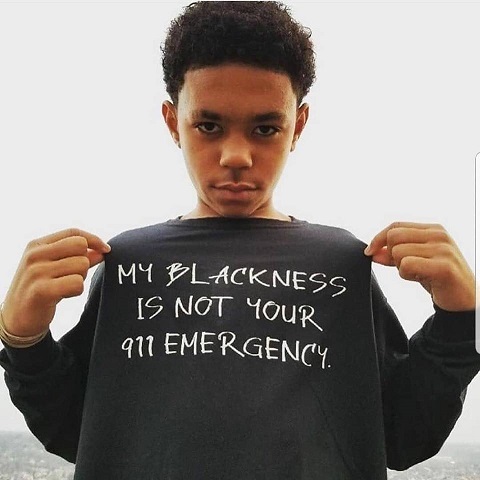 Solidarity is Holy. Show your solidarity NOW! 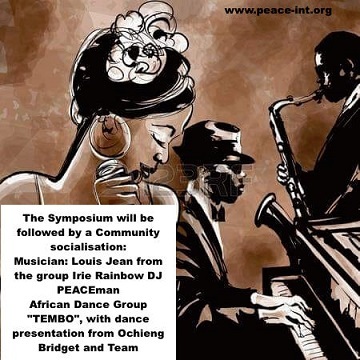 Spread the Word, Mobilise, TOGETHER WE ARE A FORCE! Isolated, we are easy victims. Any person on this world counts. You are asked to be a Part of HUMAN LIBERATION, which starts now, with you and for you. 4 au 7 octobre 2018, Iéna/Thuringia.